The reason probably for that is forum not improving at all. Forum itself got millions of dollars of investment (from donations) and didn't improved a single bit, from the first day I joined here to this day there has not been a single change on the forum itself, I remember even having a setback of no avatars for a while because of a hacking issue and now long fixed but like I said people realized there are better places out there. That is why reddit cryptocurrency and twitter and places like that get more attention because honestly it feels like a better place to talk about the topic instead. These websites just outgrew the bitcointalk and realized its not enough for them to reach everyone and moved on to the platforms where they can reach more people instead. Dear Satoshi-dice. Why have the 3x and 1.33x bets been switched overnight? This is hardly fair play considering the business model(?) Due to the unannounced change, I sent BCH to the same address that I was using less than 24 hours prior, and the was shocked to see that both bets I placed were in fact switched to a 3x payout! This can be seen by examining the following address. To me this is not in the spirit of fair betting. In fact it is highly deceptive. Please reach out and offer an explanation? Dear Satoshi-dice. Why has the 3x and 1.33 bets been switched overnight? This is hardly fair play considering the business model? Due to the announced change, I sent BCH to the same address that I was using less than 24 hours prior, and the was shocked to see that both bets I placed were in fact swithed to a 0.33x payout! This can be seen by examining the following address. To me this is not in the spirit of fair betting. In fact it is highly deceptive. Please reach out and offer an explanation? We have been busy making improvements to the site and the game play, and you are right. We did accidentally have these reversed in the user interface. We are very sorry for this mistake, and will gladly refund anyone who was affected by this mistake. Just contact us at support@satoshidice.com any time. Everything is fixed now though, and we hope you will continue to play on the site. Dear Satoshi-Dice, thanks for reaching out. I have seen a number of changes on the site recently, so I can see that happening. I see the addresses have now been changed back (as of writing). I have made contact with support and will follow up with them in the next few days. Thanks for your response, it's good to see responsiveness and transparency. Thanks. 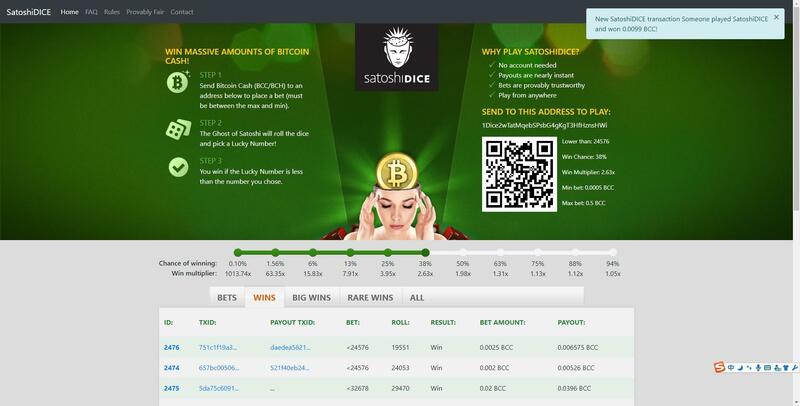 Update ^^^ Thanks Sathoshi-dice for the full refund from satoshidice support with lightning speed. Thanks guys. Hope the site improvement bring new features. Cheers!! Long live BCHABC! You commendation is really an encouragement for some of us that just rejester with satoshi -dice and I hope we see more improvements in both features and speed in some days, months and years to come. I have decided to play more games here. Just a reminder that there is ZERO registration required. No accounts, no user names and passwords, nothing at all. You just send your BCH directly from your wallet to the game, and your winnings are sent back to you instantly as well. What other wallets do you guys use, and which wallet do you think gives the best game play experience? Include your BCH address in your answer and we will send some tips to the most helpful replies. Did anyone else see the whale playing for 50BCH and winning 100 BCH at a time? Was that one of you in this thread? Yes me too, I am now checking again the website to see if there are features added good to see there are many! I am excited to make a bet here again. I am hoping that the speed of this website will still remain. Can you add coins.ph (https://cx.coins.asia) its a third party wallet here in south east asia that is legit and trusted for years now. And i think majority of my country men use this as their main wallet. Unfortunately, here in my country, Coins.ph prohibits receiving or sending funds to or from a gambling site and if they found out that funds came from or goes to a gambling site, the users account might get suspended or worst closed without prior notice in violation of their terms and conditions. We use a different wallet to receive and send funds to a gambling site. Coins.ph is a great service, but it isn't a wallet. It is more like a bank account where they control the money for you, but they also have to do whatever the government tells them to do with your money. SatoshiDice highly recommends using an actual Bitcoin Cash wallet that puts you in charge of your own Bitcoin Cash. The Bitcoin.com Wallet is a great example of this. The Electron Cash wallet also has coin shuffling built in now so you can have more privacy with your BCH. Yes I did, I saw they were 150 or so up and then back to a more reasonable 50-100k last time I saw the bets!!! Yikes!! I have always used EXODUS wallet, and I have also used COINOMI wallets!! EXODUS works great, but can take ages to resolve bets! Coinomi was ages ago (qzhhw4smfx4pts32wk06uzs9n8drlw4s2q2cxz0shz), but was working well (but admittedly a series losing bets lol): ! Love to give it another go too. Some Tips!! Yikes too much. I really like the look of satoshistack, but nobody else is playing... sad... FOMO3D is no fun anymore, the BOT-king/queen has exit scammed everyone. But Stack seems fun, but sadly a bit dead at the moment!! Look forward to more updates!! p.s. can we please have the brain lady back again...its just not the same! As far as i know Coins.ph is only for the Filipinos and only the Philippines can use it. Since government has control over it, which also stated that they will freeze the funds if they found them to be coming from the gambling sources. Thats why i do not like such wallets which do not provide you the freedom of usage.